Kol Martens – Dharma Bodhi was born in the US and travelled the world extensively in search of ancient knowledge. In University he studied biochemistry, genetics and psychology, finishing with a clinical doctorate degree in Chiropractic and post-graduate certificates in Spinal Biophysics and Physical Therapy. He began the journey of spirit at 7 years old with the practice of Hatha Yoga and breathing. In his teens and twenties he went deeper into training in daoist yoga, martial arts and meditation. In 1987 he began formal studies of traditional Tantrik Yoga, meditation and ritual and graduated as a lineage holder of Kashmir Shaivism in 1996. His Indian masters encouraged him to study other meditation traditions as well and so along the way he began training in Tibetan Tantra and Dzogchen. After meeting his root lama and taking formal initiation he completed 8 years of study and practice in the Dzogchen Meditation practices of Tibetan Yungdrung Bon and translated an ancient Tibetan practice text from that tradition. 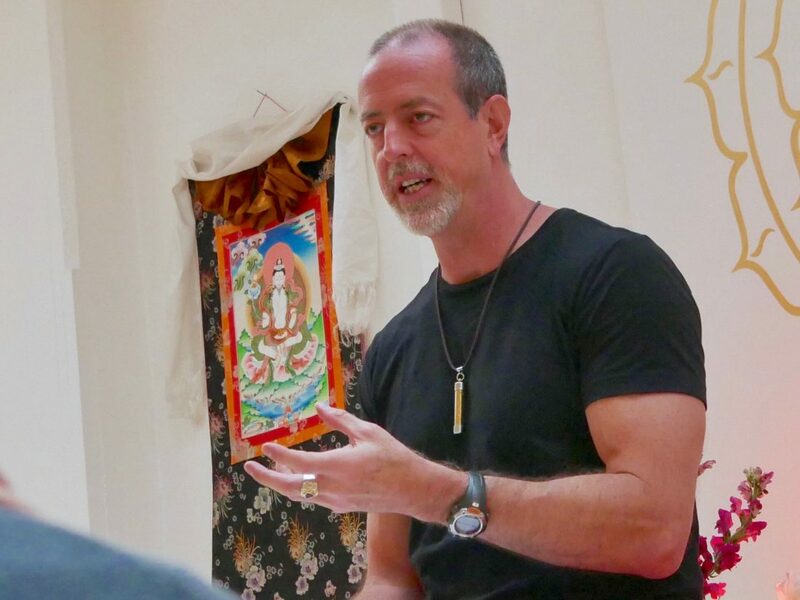 He lives in Thailand with his kids and his partner and travels extensively each year to give teachings and retreats in classical Indian Tantrik Yoga and meditation and Tibetan Dzogchen meditation. He teaches in a very grounded, no nonsense sort of way focusing on delivering the tradition’s practical benefits to the mind and body increasing health, clarity, strength of mind, natural ease and purpose in life. From May 15 – 23 Dharma Bodhi will be guest in Center Source Creations in Rotterdam. Here is the program of this week of lectures, workshops and one-to-one-sessions.